1651. “Mary F Briley,” Find-A-Grave, https://www.findagrave.com/memorial/40916703, 40916703. 1652. 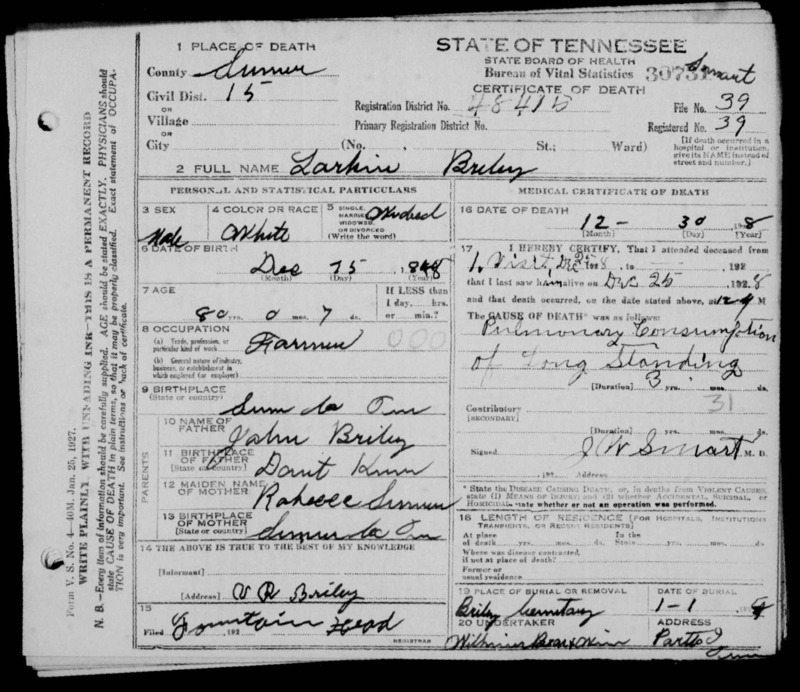 Larkin Briley, “Tennessee, Death Records, 1914-1955,” December 30, 1928, microfilm, Digital Folder Number: 004183612-Image Number: 00737-GS Film number: 1876747-Reference ID: cn 30731, https://familysearch.org/pal:/MM9.1.1/NS5V-KX3. 1653. “Tennessee, State Marriage Index, 1780-2002,” Larkin Briley and Elizabeth Suttle, February 25, 1887, Sumner County, TN, USA, Page 52, https://familysearch.org/pal:/MM9.1.1/VNZ1-XDX. 1654. 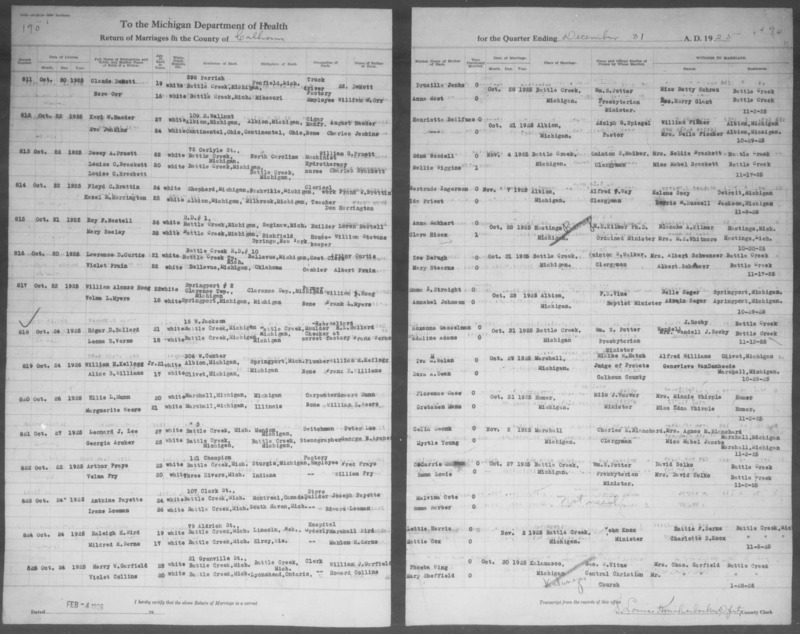 “Tennessee, State Marriage Index, 1780-2002,” John E Briley and Mary Brown, May 26, 1900, Sumner County, TN, USA, Page 188, https://familysearch.org/pal:/MM9.1.1/VNCQ-8ZD. 1655. “John E Briley,” Find-A-Grave, https://www.findagrave.com/memorial/29215861, 29215861. 1656. “Mary Evaline Brown Briley,” Find-A-Grave, https://www.findagrave.com/memorial/29215852, 29215852. 1657. Michael D Nestor, http://www.mdnestor.com/webb/webb2523.html. 1658. “Marion Franklin Webb,” Find-A-Grave, https://www.findagrave.com/memorial/103210712, 103210712. 1659. World War I, 1917, Virginia, Webb, Marion Franklin, “World War I Selective Service System Draft Registration Cards,” June 5, 1917, Lindsey, Carroll County, VA, USA, Affiliate Publication Number: M1509-GS Film number: 1984613-Digital Folder Number: 005153678-Image Number: 04855, https://familysearch.org/pal:/MM9.1.1/K6CB-NRW. 1660. “Ruth L Webb Shaffner,” Find-A-Grave, https://www.findagrave.com/memorial/91925767, 91925767. 1661. “Virginia, Births and Christenings, 1853-1917,” William A C Webb, December 7, 1860, Carroll County, VA, Indexing Project (Batch) Number: C01890-9-System Origin: Virginia-EASy-GS Film number: 31087-Reference ID: p 43, https://familysearch.org/pal:/MM9.1.1/XTWC-J6X. 1662. “Virginia, Deaths and Burials, 1853-1912,” Ambrose E Webb, February 19, 1890, Carroll County, VA, Indexing Project (Batch) Number: B02466-1-System Origin: Virginia-EASY-GS Film number: 2056976-Reference ID: p94 c66, https://familysearch.org/pal:/MM9.1.1/X5RV-PLG. 1663. “Virginia, Births and Christenings, 1853-1917,” Eugene C Webb, July 6, 1889, Carroll County, VA, Indexing Project (Batch) Number: I01781-3-System Origin: Virginia-EASy-GS Film number: 2046922-Reference ID: 337, https://familysearch.org/pal:/MM9.1.1/XTHW-3VD. 1664. “Virginia, Births and Christenings, 1853-1917,” Ardel T Webb, 11 14 1893, Carroll County, VA, Indexing Project (Batch) Number: I01781-4-System Origin: Virginia-EASy-GS Film number: 2046922-Reference ID: 398, https://familysearch.org/pal:/MM9.1.1/XTH3-XQM. 1665. “Virginia, Births and Christenings, 1853-1917,” Sylvan A Webb, September 12, 1887, Carroll County, VA, Indexing Project (Batch) Number: I01781-2-System Origin: Virginia-EASy-GS Film number: 2046922-Reference ID: 304, https://familysearch.org/pal:/MM9.1.1/X5XH-VQF. 1666. “Virginia, Births and Christenings, 1853-1917,” Ambrose E Webb, May 28, 1885, Carroll County, VA, Indexing Project (Batch) Number: I01781-1-System Origin: Virginia-EASy-GS Film number: 2046922-Reference ID: p 272, https://familysearch.org/pal:/MM9.1.1/X5XH-6PF. 1667. “William Andrew Campbell Webb,” Find-A-Grave, https://www.findagrave.com/memorial/61507633, 61507633. 1668. “Alexander Smith Webb,” Find-A-Grave, https://www.findagrave.com/memorial/37772754, 37772754. 1669. “Cornelia Adeline Stanford Webb,” Find-A-Grave, https://www.findagrave.com/memorial/37763498, 37763498. 1670. “Richard Stanford,” Find-A-Grave, https://www.findagrave.com/memorial/7372571, 7372571. 1671. “Frances Elizabeth Webb Adams,” Find-A-Grave, https://www.findagrave.com/memorial/99057779, 99057779. 1672. “Bernice Leslie Reed,” Find-A-Grave, https://www.findagrave.com/memorial/25464424, 25464424. 1673. “Frances Belle DeWees Webb,” Find-A-Grave, https://www.findagrave.com/memorial/8758348, 8758348. 1674. “Esma Elizabeth Cook Reed,” Find-A-Grave, https://www.findagrave.com/memorial/25464398, 25464398. 1675. “George Nicholas Cook,” Find-A-Grave, https://www.findagrave.com/memorial/48422264, 48422264. 1676. “Johnnie Tennessee Deweese Cook,” Find-A-Grave, https://www.findagrave.com/memorial/48422399, 48422399. 1677. “Edgar Lee Cook,” Find-A-Grave, https://www.findagrave.com/memorial/108491578, 108491578. 1678. “Nellie Tommie Hardin Cook,” Find-A-Grave, https://www.findagrave.com/memorial/108496118, 108496118. 1679. “Ella Townsend Cook,” Find-A-Grave, https://www.findagrave.com/memorial/108511443, 108511443. 1680. “Oscar E Webb,” Find-A-Grave, https://www.findagrave.com/memorial/113105864, 113105864. 1681. “Johan Oscar Larson,” Find-A-Grave, https://www.findagrave.com/memorial/8759249, 8759249. 1682. “Alma Maria Larson Hemme,” Find-A-Grave, https://www.findagrave.com/memorial/8758473, 8758473. 1683. “Walter August Hemme,” Find-A-Grave, https://www.findagrave.com/memorial/8758513, 8758513. 1684. “August G Hemme,” Find-A-Grave, https://www.findagrave.com/memorial/8758562, 8758562. 1685. “Emma J Moeller Hemme,” Find-A-Grave, https://www.findagrave.com/memorial/8758574, 8758574. 1686. “Joseph Emanuel Larson,” Find-A-Grave, https://www.findagrave.com/memorial/79635433, 79635433. 1687. “Dorothy Ruth Larson,” Find-A-Grave, https://www.findagrave.com/memorial/79635432, 79635432. 1688. “Nancy J Buller,” Find-A-Grave, https://www.findagrave.com/memorial/7657656, 7657656. 1689. “Alvin D Buller,” Find-A-Grave, https://www.findagrave.com/memorial/7657655, 7657655. 1690. “Aaron Victor Larson,” Find-A-Grave, https://www.findagrave.com/memorial/79635431, 79635431. 1691. “Lela Marion Larson,” Find-A-Grave, https://www.findagrave.com/memorial/79635434, 79635434. 1692. “Michigan, Marriages, 1868-1925,” Raleigh H Bird and Mildred H Serns, November 2, 1925, Battle Creek, Calhoun County, MI, USA, GS Film number: 2342767-Frame Number: -Digital Folder Number: 4001631-Image Number: 649-Reference ID: v 2 p 190 rn 824, https://familysearch.org/pal:/MM9.1.1/NQ73-BL9. 1693. “Albert C Larson,” Find-A-Grave, https://www.findagrave.com/memorial/96897166, 96897166. 1694. “Lois A Larson,” Find-A-Grave, https://www.findagrave.com/memorial/96897202, 96897202. 1695. “Maude C Larson Eberhardt,” Find-A-Grave, https://www.findagrave.com/memorial/87245154, 87245154. 1696. Anna Hox Serns, “Oregon, Death Index, 1903-1998,” January 6, 1973, Josephine County, OR, https://familysearch.org/pal:/MM9.1.1/VZW8-PVJ. 1697. “Telitha Y Webb,” Find-A-Grave, https://www.findagrave.com/memorial/42130858, 42130858. 1698. “Elizabeth Webb Perdue,” Find-A-Grave, https://www.findagrave.com/memorial/109548818, 109548818. 1699. “Asa Perdue,” Find-A-Grave, https://www.findagrave.com/memorial/109548785, 109548785. 1700. John Dewees Webb, “Soldiers of the FIrst Wolrd War - Canadian Expeditionary Force,” July 2, 1918, Winnipeg, MB, Canada, 2504440, http://www.bac-lac.gc.ca/eng/discover/military-her...aspx?IdNumber=303173.